The best free RTS gaming you'll find, the Celts bring AoEO two steps closer to greatness. My half-naked Woad Raiders leap into a formation of Roman archers with axes whirling around them. Meanwhile, in a serene forest far from battle, my Augur sacrifices a sacred fawn to Andrasta, goddess of war. Lightning crashes and my army glows with magical energy as the goddess' boon charges their devastation of the Roman outpost. 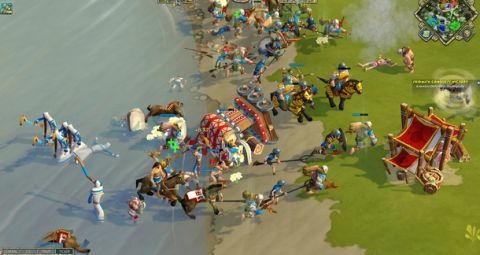 The Celts, the newest civilization added to Age of Empires Online's free-to-play roster, is the best one released yet, adding several new mechanics that advance the game's complexity and will appeal to RTS gamers who crave more micromanagement. The first major addition is activated abilities on individual units, like the four different animal sacrifices available to the Augur to buff your army in various ways, that raise the skill ceiling for managing troops in battle. For their part, the Celts field a fun army heavily focused on foot soldiers. My favorite are the iconic shirtless, axe-wielding Woad Raiders who can be upgraded with a Charge ability that lets them leap-attack enemies and deliver a guaranteed critical attack on their first hit. Stone Throwers (burly men that hurl rocks) are a close second, and the closest the Celts get to building siege weapons. Their military roster allows for some pretty unique armies distinct from the existing civs' offerings, and resource perks like Gold Mines that garrison villagers and Sacred Deer that can be sacrificed or carved for food keep the economy interesting as well. As a Premium civ, it and its entire 80-mission campaign are free to everyone, but its power is limited until you pay 10 bucks to unlock all the features . Everyone should play the campaign: it's the best one Gas Powered has made yet, with a surprising number of creative scenarios. My favorite gives you three characters (a battering ram, a druid, and an archer) stuck on separate paths that often weave past each other. Each encounters foes impossible to defeat alone, so you have to pick the right tool for the job and find ways for them to aid one another despite being separated. Other highlights include a repeatable racing-style mission to lead a merchant ship through treacherous waters with randomized hazards and a one-man mission to escape an enemy prison outpost as the Celtic hero unit. The Celtic patch also included a bunch of welcome quality-of-life tweaks, including instant-travel buttons to navigate between cities on the world map, and coincided with the game's launch on Steam . A Games for Windows Live account is still required to play. Although I've had a fair amount of success with the Celts in PvP, the community consensus is that they're a bit underpowered. What really matters is that they have unique and interesting mechanics that make them fun to play; the stat numbers can be tweaked for balance later.